•1990 to 1993 Acura Integra GSR 1.7L. •1986 to 1989 Acura Integra RS, LS, GS 1.6L. •1990 to 1993 Acura Integra RS, LS, GS 1.8L. •1988 to 1991 Honda Civic EX 1.5L. •1988 to 1991 Honda Civic Si 1.6L. "SARD" Style. For sale is a complete B Series Honda / Acura fuel system. This system allows you to replace the factory fuel feed line, fuel rail, and regulator for a clean custom look while adding adjust-ability and functionality. AEM's Honda/Acura Adjustable Fuel Pressure Regulators are capable of supporting enough fuel flow for engines up to 1000 horsepower. AEM includes a custom barb fitting to accommodate the factory fuel hose and the base of each regulator is tapped to accept a -6 AN or 9/16"x18 fittings. A EM's Universal Adjustable Fuel Pressure Regulator is capable of supporting enough fuel flow for engines up to 1000 horsepower. Our universal FPR is tapped to accept a -6 AN, or 9/16”x18 fittings and includes a 1/8 NPT port for a fuel pressure gauge or pressure sensor pick up. AEM Fuel Rails for Honda / Acura B or D Series Engines. (1) Fuel Feed Line Adapter Fitting. (2) 1/8" Port Plug. (4) Upper injector o-ring. AEM High Flow Fuel Filter. Capable of supporting fuel flow for vehicles up to 500 horsepower. AEM's Honda/Acura Adjustable Fuel Pressure Regulators are capable of supporting enough fuel flow for engines up to 1000 Horsepower. Regulator Location :Fuel Rail Mount. Regulator Type :Straight. Fuel Type :Gasoline. 100% Genuine AEM products or double your money back. Thread sizes for filter are 12x1.25 top and 14x1.50 bottom for fittings (universal applications). Supports flow for racing and Motorsports vehicles up to 500 horsepower. AEM Fuel Rail Acura Integra 25-100BK. 03-05 Honda Civic Si/acura rsx k20a3 Aem High Volume Fuel Rail. Condition is New. Shipped with USPS Parcel Select Ground. A custom fuel line fitting is included for the factory fuel line, and in most cases the ends of each rail are pre tapped to accept -6 AN or 9/16”x18 fittings for users who want to use custom fuel lines. CNC-machined from 6061-T6 billet aluminum Mounts directly to O.E. fuel rail or AEM High Volume Fuel Rail Patented interchangeable discharge orifices match output of virtually any fuel pump Accept a -6 AN or 9/16?x18 fittings Adjustable from 20 psi to maximum fuel pump capacity Interchangeable discharge ports match regulator output to output of any fuel pump No additional parts required for installation Manufactured and assembled in the USA Patent # 6,298,828 Application: 90-93 Acura Integra 1.8L 1.7L 86-89 Acura Integra 1.6L 91-05 Acura NSX 3.0L 3.2L 95-98 Acura TL 2.5L 3.2L 92-94 Acura Vigor 2.5L 88-91 Honda Civic EX Si CR-X 1.5L 1.6L 92-01 Honda Prelude H22 H23 Disclaimers: Images in most cases are for display purposes only. Please read carefully about the product before buying, and contact us if you have any questions. 25-100BK Acura 1994-2001 Integra RS, LS, GS, GS-R, and Type-R. A custom fuel line fitting is included for the factory fuel line, and the ends of each rail are pre tapped to accept -6 AN or 9/16”x18 fittings for users who want to use custom fuel lines. CNC-machined from 6061-T6 billet aluminum Mounts directly to O.E. fuel rail or AEM High Volume Fuel Rail Patented interchangeable discharge orifices match output of virtually any fuel pump Accept a -6 AN or 9/16?x18 fittings Adjustable from 20 psi to maximum fuel pump capacity Interchangeable discharge ports match regulator output to output of any fuel pump No additional parts required for installation Manufactured and assembled in the USA Patent # 6,298,828 Application : 98-99 Acura CL 2.3L 4Cyl 98-02 Honda Accord 2.3L 4Cyl 96-00 Honda Civic 1.6L 96-97 Honda Del Sol 1.6L SOHC 00-05 Honda S2000 2.0L 2.2L VTEC Disclaimers: Images in most cases are for display purposes only. Please read carefully about the product before buying, and contact us if you have any questions. Car Make: Acura Honda. 1994 to 2001 Acura Integra GSR 1.8L. 1994 to 2001 Acura Integra RS, LS, GS 1.8L. The fit and finish is high quality, and the price is affordable. 1996 to 2000 Honda Civic CX, DX, LX 1.6L. 1990-2001 Acura Integra RS LS GS - B18A, B18B Engines. AEM 25-100BK. Works with factory fuel line or custom fuel lines. Supports fuel flow up to 1,000 Horsepower. 1/8 NPT Port included for nitrous pick up or fuel pressure gauge. For Acura B18B1, B18C1 & B18C5. A custom fuel line fitting is included for the factory fuel line, and in most cases the ends of each rail are pre tapped to accept -6 AN or 9/16”x18 fittings for users who want to use custom fuel lines. Trending at $103.43eBay determines this price through a machine learned model of the product's sale prices within the last 90 days. 25-300BK Adj. Pressure Regulator 1/8 NPT port included for nitrous pick up or fuel pressure gauge. Works with factory fuel line or custom fuel lines. Supports fuel flow up to 1,000 horsepower. Pre-tapped for -6 AN or 9/16"x 18 fittings(Excluding 25-130BK). 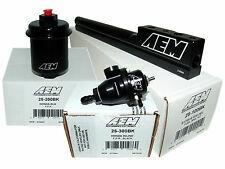 AEM has engineered two fuel filters capable of supporting power applications from 500-1350 horsepower. Dubbed the AEM High Performance Filter and AEM Race Filter, both filter housings are constructed from 6061 aluminum and feature double O-ring seals for added leak protection. AEM Electronics. 2002-2006 RSX (all). fuel bore capable of flowing enough fuel to support most high-horsepower applications. Instructions, hardware, fittings, and injector O-rings are also included. AEM's Honda/Acura Adjustable Fuel Pressure Regulators are capable of supporting enough fuel flow for engines up to 1000 horsepower. AEM includes a custom barb fitting to accommodate the factory fuel hose and the base of each regulator is tapped to accept a -6 AN or 9/16”x18 fittings. AEM Fuel Pressure Regulator Fuel Rail. Mounts to OEM fuel rail or AEM fuel rail. AEM adjustable fuel pressure regulator. AEM fuel rail. Custom fuel line fitting is included for the factory fuel line and the ends of each rail are tapped to accept -6AN or 9/16" x 18 fittings for users who want to use custom fuel lines. 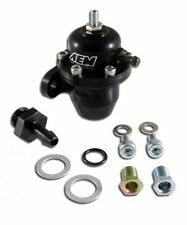 AEM's Adjustable Fuel Pressure Regulator Kit is capable of supporting enough fuel flow for engines up to 1000 horsepower. This universal fuel pressure regulator is tapped to accept a -6 AN, or 9/16”x18 fittings and includes a 1/8 NPT port for a fuel pressure gauge or pressure sensor pick up. A custom fuel line fitting is included for the factory fuel line, and the ends of each rail are pre tapped to accept -6 AN or 9/16”x18 fittings for users who want to use custom fuel lines. Fits: 1994-2001 Acura Integra 1.8L. Adj Pressure Regulator for 94-01 Acura Integra - 25-300BK. AEM Electronics. 25-300BK Adjustable Fuel Pressure Regulator 1/8 NPT port included for nitrous pick up or fuel pressure gauge. Works with factory fuel line or custom fuel lines. AEM Electronics. AEM's Honda/Acura fuel rail mounted adjustable fuel pressure regulator is capable of supporting enough fuel flow for engines in excess of 1000 horsepower. AEM ELECTRONICS FUEL PRESSURE REGULATOR BLACK. 1994-2001 Acura Integra GSR & Type R - B18C1, B18C5 Engines. AEM 25-100BK. Works with factory fuel line or custom fuel lines. Supports fuel flow up to 1,000 Horsepower. 1/8 NPT Port included for nitrous pick up or fuel pressure gauge.